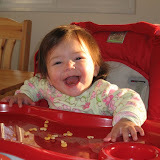 Mommy and Daddy bought me a highchair (and a toy chest, and clothes and and and... They also say that more present will be arriving soon). It is so cool that I can sit down with all the family and eat with them at the table (although I have my own little table). So now sometimes, instead of feeding me with a spoon or by handing me the food to my mouth, M&D just put the food on the table and I take it from there!